JayWalk - All Your Xmms Are Belong To Me: Playing God? To continue from where I left off yesterday, Qiaoyun also got me thinking about another question. How do we decide who to help and who not to help? It sounds like I am play God. No? We don't have a choice there, considering the fact that we are operating on very little resources. We not only have to account for every penny, but also to stretch them if we can. So seriously, who do we help and how do we go about arriving at such a decision to do so? Well, first of all, there must be kismet for us to cross paths. It has to be a case either the person heard of RFF and came forward seeking help or we chance upon the plight of the person in need and we offer our assistance. If not, then it would be a case of us covering the holes over here and the person in need being located somewhere else. This is why I said yesterday that we need more "scuba diving teams" to provide a better coverage. Next, we have to determine if the case is genuine. In this modern day and age, we have too many crooks out there trying to con you for your money. Too often do we see people being overly enthusiastic in wanting to help that he or she would fail to recognise that they were in fact, being duped. So for us, whenever we review a particular case, we put in a lot of effort in due diligence for the sake of making sure that the person is indeed in need of our help. Then comes the part, where we evaluate if our assistance would yield any benefit. I believe it is a cliché to say that not everything is about money. For cases that we are not able to provide any help, we may refer them to other people who are able to do a better job than us. We won't take up a case for the sake of taking up a case. I mean what is the point if you are going to creating a bigger mess than it already is, right? Last and most importantly, is that whoever we are helping must first want to be helping him/herself first. Getting someone out of a hard situation is a partnership between the help giver and the help receiver. There is really no light at the end of the tunnel if the receiver doesn't want to help him/herself. This is the worst kind. The kind that would just sit there and wait for handout while they themselves just slacking away, waiting to be served. Everything is taken for granted or ever rudely demanded as if we owed him/her the help. The really sucky thing about this kind of situation is that you committed resources to a hopeless cause and at the expense of some other genuine case out there who could have benefited, had we helped the latter instead of the prior. This is where we draw the line. If you can't be bothered to help yourself, then neither should we. Remember the case with Baby Tory? 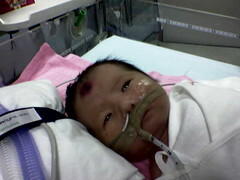 A check with KK Hospital confirmed the baby's condition and we set aside money to help with the medical expenses. However, we insisted in checking out the baby's home as a precautionary assessment. However, it was strange that both the parents and uncle aren't forthcoming as far as coordinating with us. The uncle cited the reason as the parents felt uncomfortable seeking strangers for help. It was exasperating, for here we have a baby's life slowly ebbing away and the parents are too proud to ask for help. In the words of Adrian, "If it meant that I get to save my child's life, I f*cking get down on my knees and beg for help, man!" At the end of the day, we withdrew our assistance and while it was a pity that baby Tory will be fading slowing into death's grip, there is nothing further that we can do if nobody in the family wants to do anything anyway. Click here and scroll down to Section 3 to learn more about Baby Tory. Agree with your friend. If I'm the parents, I would be doing whatever I can... I would not reject help that has appeared in front of me. If it's such a simple thing as home visitation, by all means, go ahead! Sometimes, one must look at the bigger picture instead. Aloe: Apparently for that family, their face is worth more than their kid's life. Go figure. hi Jay, maybe they had help from other resources. I think sometimes we can't expect that people are only reliant on one source/resource. Maybe by the time this offer was given, he'd already got it sorted? Pam, even if that's so, I think they should have the courtesy to at least, let other people know. Then they would not have to wait and wait for the reply. Anyway, for medical bills, it's very hard to say how much it will come up to, in the end. If it's me, I will just take first. Then when everything is over, start returning the rest of the money (if there's any left) to those people who have helped me. Pam: From what we know, they didn't have any other sources. All the funds from the initial well wishers were already exhausted. In that perticular case, the family was just being tardy. Aloe: I very much agree with you in the sense that I could have used the funds elsewhere during that period of time. With limited resources, there are other people who needed the help but couldn't get it as a result of the previous case holding up matters. At times, we have cases where time is critical. We recently lost a leukemia boy because Gahmen red tape delayed donor's arrival by 2 weeks. By the time, the donor was cleared to come to Singapore, the leukemia boy died already. perhaps it might be more than just face, although i cannot think why. AKK: Well, you guess is as good as mine.